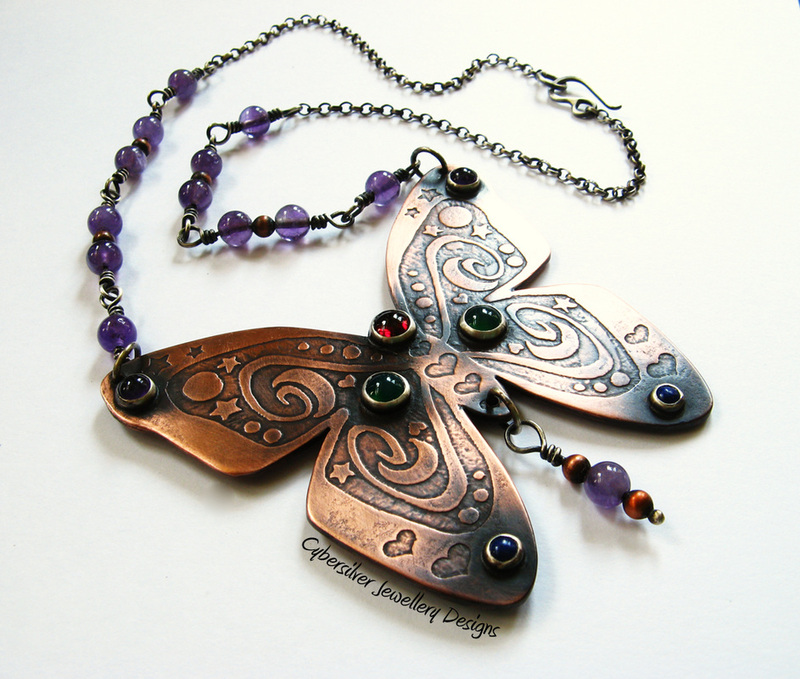 A gorgeous one-of-a-kind solid copper butterfly set with gemstones. 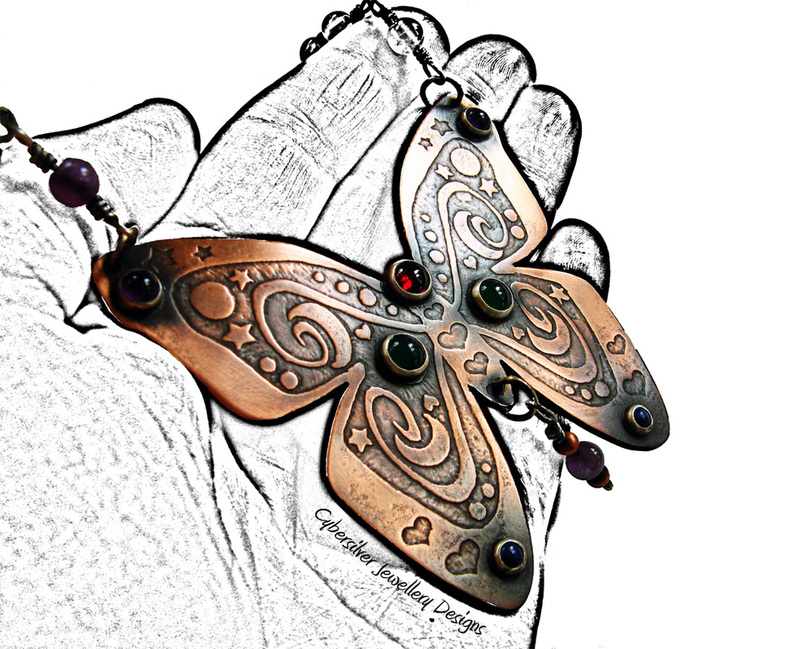 This beautiful butterfly is hand cut from solid copper and is set with a 6 mm Garnet, two 6 mm Amethysts, two 6 mm Green Onyx and two 4 mm Lapis Lazuli gemstones, each in a fine silver bezel. 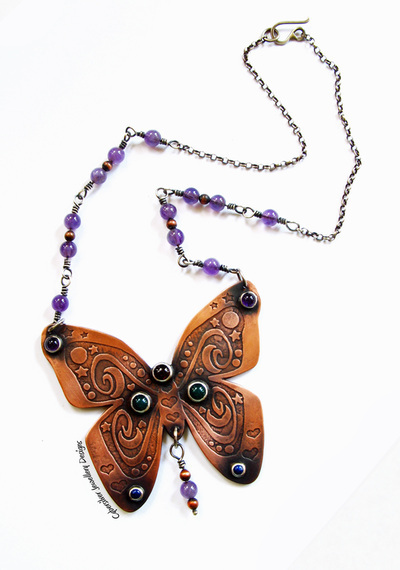 The pendant measures roughly 75 mm x 70 mm and hangs from an 18" sterling silver chain which I have accented with 12 amethyst gemstone beads, 4 solid copper beads, and a hand-made silver clasp. The pendant and chain have been oxidised, burnished and waxed. This is a one-of-a-kind necklace and a real statement piece. 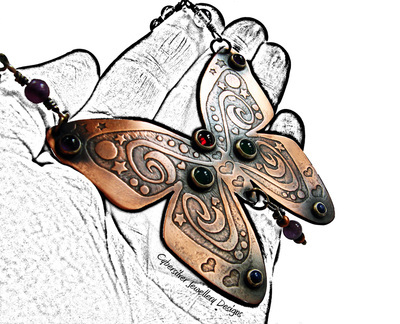 Copper has long been used as a healing metal, especially for arthritis and rheumatism. It has also been used to help blood and metabolism disorders. It acts as a conductor when worn on the body and will help the healing effect of any stone when both touch the body. Any stone set in copper or used with copper with have an enhanced energy field and copper also enhances the energy of silver and gold. Amethyst is a powerful and protective stone. It is said to foster healing and selflessness. It relieves stress and strain, soothes irritability, dispels anger, fear, sadness and grief. Amethyst activates spiritual awareness, opens intuition and enhances psychic abilities. It is the birthstone for February.